This Irish blessing plaque pays tribute to mom and it is enhanced with Celtic knots. 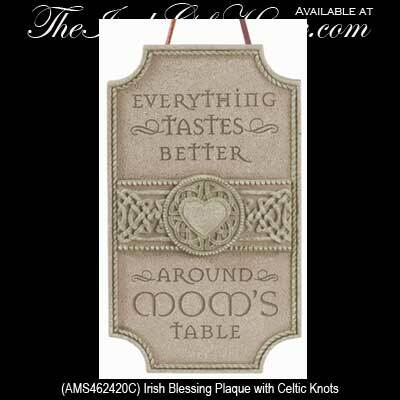 This Irish blessing plaque features the following verse: Everything tastes better around mom’s table. This Irish blessing plaque is a praise for the love that is given by mom in the food she cooks. The mother's blessing plaque is made of cement and resin and the dimensional design measures 4" wide x 7" tall. The Irish blessing plaque is ready to hang with the included cord and it is gift boxed with a Celtic knot history card that is complements of The Irish Gift House.